MUNICH SHOW: Electrocompaniet to launch ECT 3 system remote | What Hi-Fi? 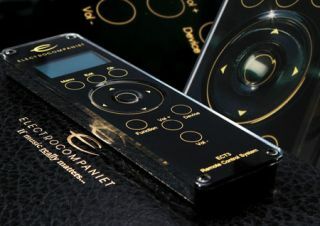 Norwegian hi-fi company Electrocompaniet will use the Munich High End Show next week to launch its new ECT 3 system remote control. The device is designed to match the company's Classic line of electronics, with a metal base and acrylic front. It supports both IR and RF transmission, and the built-in screen can display information from compatible components in your system. The click-wheel control has the same functionality as the buttons on Electrocompaniet's amplifiers and CD players. The ECT 3 also supports the firm's Prelude Line kit, including the PD 1 DAC. When combined with the PD 1, the ECT 3 can also be used for controlling playlists on your computer. Electrocompaniet says the ECT 3 will be available in June for £300.